BANGKOK: The Department of Special Investigation (DSI) has vowed to renew its efforts to raid Wat Phra Dhammakaya and arrest embattled abbot Phra Dhammajayo by July 13 after the temple search failed yesterday (June 16) in the face of peaceful resistance by followers. Following the unsuccessful raid, Pol Maj Suriya Singhakamol, deputy DSI chief, said that the arrest warrant for the abbot still stands and the DSI will have to continue to execute the warrant. 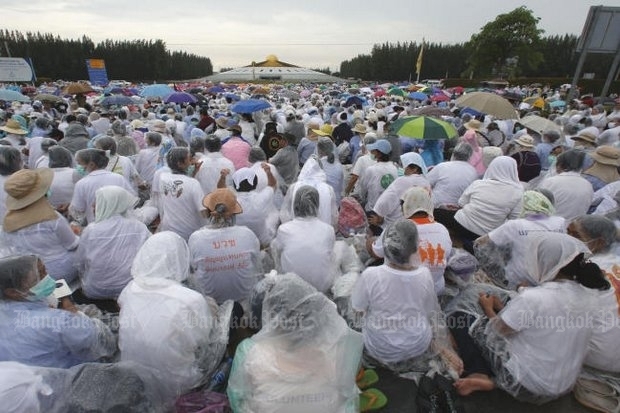 While the DSI attempted to carry out the search, the monk’s supporters – wearing white – sat praying, refusing to make way for DSI officials to search the temple. Dhammakaya followers issued a statement Thursday calling for the arrest of Phra Dhammajayo to be delayed until democracy had returned to the country. They said he would not receive justice under the present regime. While Wat Phra Dhammakaya covers more than 2,000 rai, the DSI obtained a search warrant to search only 196 rai. After presenting the search warrant to temple staff, the officials entered the temple through Gate No.7. Pol Maj Suriya said the DSI is expected to seek a new search warrant before July 13 – on the day the Office of the Attorney-General decides whether to indict Phra Dhammajayo in a money laundering case. The 72-year-old abbot is accused of involvement in money laundering and receiving stolen property worth B1.2 billion in connection with the B12-billion embezzlement at the Klongchan Credit Union Cooperative. He has denied the charges through a spokesman. Pol Maj Suriya said the DSI investigators will meet to assess the result of the temple non-search to improve planning for the next raid. Justice Minister Paiboon Koomchaya said he will ask DSI chief Paisit Wongmuang on Friday to brief him on the search operation. Gen Paiboon also said it was reasonable that authorities exercised caution to avoid a confrontation with the abbot's devotees. Deputy national police chief Pol Gen Srivara Ransibrahmanakul said the Special Branch Police’s intelligence reports confirmed that Phra Dhammajayo remained within the temple premises. In seeking a search warrant from the court, the DSI will need to inform the court how many officials will be deployed for the search operation and the names of the officials must also be submitted, Pol Gen Srivara said. He added the police force is ready to deploy officers to support a fresh DSI raid when a new search warrant is approved by the court, he said. The DSI also filed a complaint Thursday with the Khlong Luang police in Pathum Thani asking that it to take legal action against temple followers who allegedly obstructed the authorities' attempt to search the temple. A DSI source said the DSI investigators will meet again to work out tougher measures to arrest the abbot. The source also said it is now clear that the abbot’s followers had an intention to obstruct the work of authorities, and this will justify refusing the abbot bail. At 1:30pm, Pol Maj Suriya announced the cancellation of the search of the temple for Phra Dhammajayo at a press conference. Also present were Khlong Luang police and senior monks of Wat Phra Dhammakaya. Pol Maj Suriya said the search was called off because of several factors, especially the large number of Phra Dhammajayo's disciples who sat in the rain meditating all around the compound, and unclear information about the exact whereabouts of the abbot. He said the mission had not been completed and officials still had the authority to act under a court warrant to arrest Phra Dhammajayo. He added that the DSI would report to the court in detail about the problems authorities encountered during the failed search. The DSI would leave it to the court to decide on further action, he said. “I believe all members of the media have witnessed what the DSI has done, and how the disciples responded. We have stood by the principle of maintaining law and order. All units taking part in the search today have tried to avoid confrontation,” Pol Maj Suriya said. He said the authorities had recorded and taken pictures of actions that could be construed as obstruction of DSI officials and police doing their duty. Outside the temple compound, police had taken legal action against people in 14 cases, he added. Phra Sanitwong Wutthiwangso, director of communications for Wat Phra Dhammakaya, said the temple had provided full cooperation to the DSI, although the disciples had pleaded for mercy because the abbot was very sick. He had not fled. He said it was impossible for the temple to stop the disciples from turning up in large numbers to meditate out of concern for Phra Dhammajayo’s well-being. Phra Sanitwong said he was willing to cooperate with the DSI to let officials search the compound. Great! Next attempted Raid already announced,--> 13 July! Thank you for date info, DSI! We prepare us for your coming. Gives monks and followers many weeks time in advance to prepare again for non resistance blockade as it was a few days ago? What kind of people are in charge of DSI? It looks like they not want to arrest that accused criminal sect abbot.